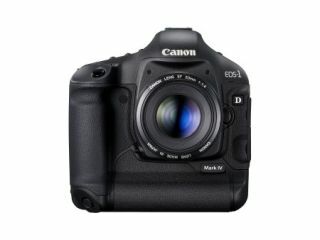 Canon has officially introduced its latest Full HD capable DSLR to the market – the Canon EOS 1D Mark IV. The camera sports a 16MP APS-H CMOS sensor, an expanded ISO setting of ISO 102,400 and brand-new AF system which now reaches 45 points. Canon is pitching the camera at news and sports photographers, and those who "require reliability in fast-paced, high-pressure situations". When it comes to high-burst shooting, the camera can pelt out 10fps, this all down to the device's Dual 'DIGIC 4' processors. As was the case with Nikon's latest professional shooter, the Nikon D3s, the Canon EOS 1D Mark IV is very capable in low-light, with the camera boasting an ISO range of 100-12,800, which is extendable to 102,400 – the highest seen on any Canon camera. This makes it ideal for shooting in near-dark situations sans flash. The Mark IV's video capabilities are impressive, with the camera able to capture 1080p high definition video at 30, 25 and 24fps and 720p footage at 60 and 50fps. If you fancy the sound of the Canon EOS 1D Mark IV, then it has a release date of the end of December and is priced at £4,499. Go to www.canon.co.uk for more details.